This article has been viewed 12635 times. Teens who are overweight, get little exercise or who smoke may be more likely to have frequent headaches and migraines than teens with none of these factors, according to a study published in the online issue of Neurology®, the medical journal of the American Academy of Neurology. Teens with all three of the negative lifestyle factors were 3.4 times more likely to have frequent headaches than those with none of the negative lifestyle factors. Of those with all three negative lifestyle factors, 55 percent had frequent headaches, compared to 25 percent of those with no negative lifestyle factors. Those with two negative factors were 1.8 times more likely to have frequent headaches. Overweight teens were 40 percent more likely to have frequent headaches than those with no negative factors. Teens who smoked were 50 percent more likely to have frequent headaches, and teens who exercised less than twice a week were 20 percent more likely to have frequent headaches than those who exercised at least twice a week and had no other negative factors. "These lifestyle factors have rarely been studied in teens," said Andrew D. Hershey, MD, PhD, of the University of Cincinnati College of Medicine and a member of the American Academy of Neurology, who wrote an editorial accompanying the study. "This study is a vital step toward a better understanding of lifestyle factors and potential preventive measures that can be taken." As part of the Nord-Trøndelag Health Study, 5,847 students age 13 to 18 in Nord-Trøndelag county in Norway were interviewed by nurses about headaches and their weight and height measurements were taken. They also completed a questionnaire about physical activity and smoking. 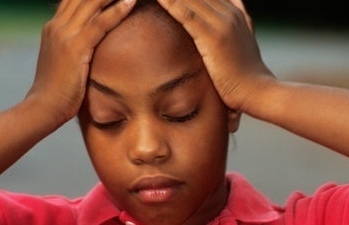 Out of the group, 36 percent of girls and 21 percent of boys reported having recurrent headaches within the last year. A total of 16 percent of the students were overweight, 19 percent were smokers, and 31 percent exercised less than twice a week. Study author John-Anker Zwart, MD, PhD, of the University of Oslo said the study suggests that the treatment and prevention of headaches in teens may need to include management of healthy habits such as regular exercise, healthy food choices and stopping smoking.